If you are running your own business then you may be contemplating the best way to get some kind of office solution for your business. Not everyone is ready to get onto a long term copier lease right away. That’s why at Albuquerque Copier we provide a number of used copiers for your business that can get you started with something to kick start your business. Used copiers can be a great option for a variety of different kinds of people. They aren’t just for people that don’t have the money. It’s about people who are worried about future cash flow or aren’t sure where their business is going to end up. 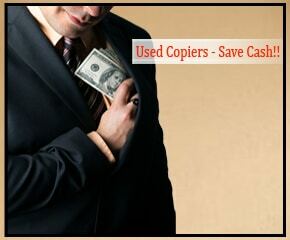 Used copiers are also a great option for those who don’t want to deal with a leasing company. These people want more freedom and don’t want to have to add additional monthly payments to what they already own. Getting a used copier doesn’t have to mean that you are settling for something less. Our selection of used copiers are all in great condition and ready to be used right away. We work with responsible businesses who took great care of their copiers when they had them on leases. Now we take those amazing machines and offer them to you for great prices. Getting a used copier for your business shouldn’t seem like a last resort. There are many people who get amazing used copiers for a great price from our Albuquerque Copier store. Let us show you the possibilities that a used copier can bring to you.